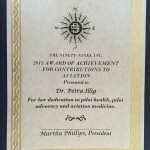 Dr. Petra Illig graduated from the University of Washington School of Medicine in Seattle and also obtained her private pilot license in 1981. Board certified in Emergency Medicine, she worked in that field for 15 years. As a pilot, she became interested in aerospace medicine, and went on to become an FAA Aviation Medical Examiner in 1984. In 1998 she became the first Regional Medical Director of Aircrew Health Services for Delta Air Lines. Although her primary role was as a flight surgeon, she also had oversight of passenger medical emergencies. She was instrumental in developing the airline’s in-flight medical emergency response system, which is in effect to this day. During her tenure at Delta, she became acutely aware of the problems associated with passenger health, and brought attention to the airline’s management that continued neglect of these critical issues would bring significant liability concerns. By participating in various committees as the national level, she has helped bring passenger health issues onto the FAA’s radar screen. 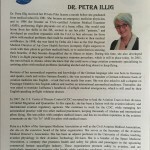 She co-authored a publication in the journal of Aviation, Space, and Environmental Medicine on passenger medical emergencies, and gave presentations at various aeromedical meetings on this topic in the United States and in Russia. 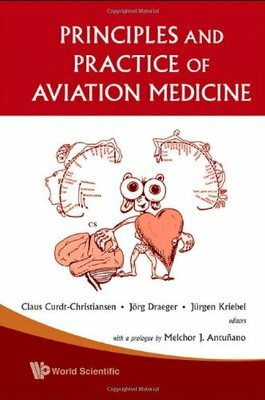 She also wrote the first chapter on the subject of Passenger Health in a textbook published in 2009 titled “Principles and Practice of Aviation Medicine”. Parenthetically, she translated the entire textbook from its original version in the German language into English. Dr. Illig has been in private practice in aviation medicine in Anchorage, Alaska since 2001. She is also currently Alaska’s quarantine medical officer for the Centers for Disease Control & Prevention’s (CDC) Division of Global Migration and Quarantine, a position she has held since 2007. She co-authored the chapter on Air Travel in CDC’s Yellow Book, which is internationally known as the authority on travelers’ health. In August 2014, CDC deployed her to Guinea, West Africa, to strengthen the passenger screening program during the Ebola outbreak at the international airport in Conakry. 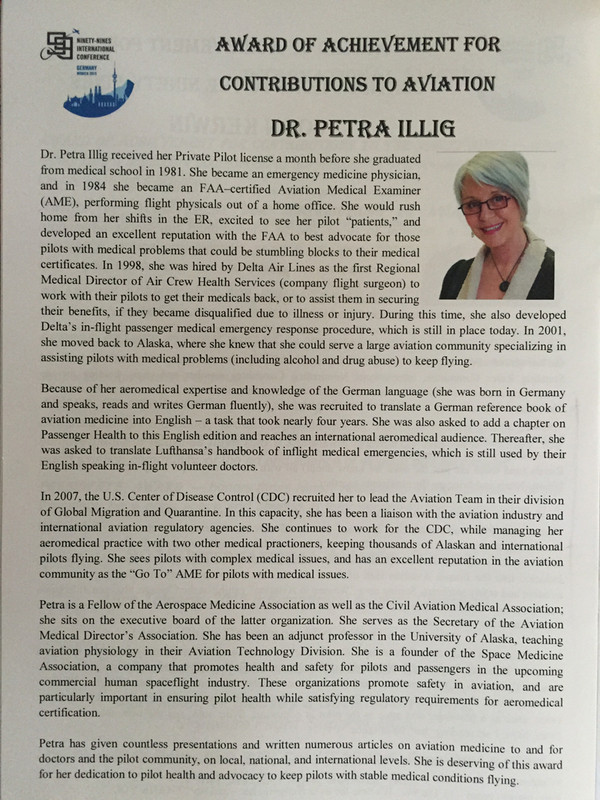 She is a Fellow of the Aerospace Medicine Association (AsMA) and the Civil Aviation Medicine Association (CAMA). 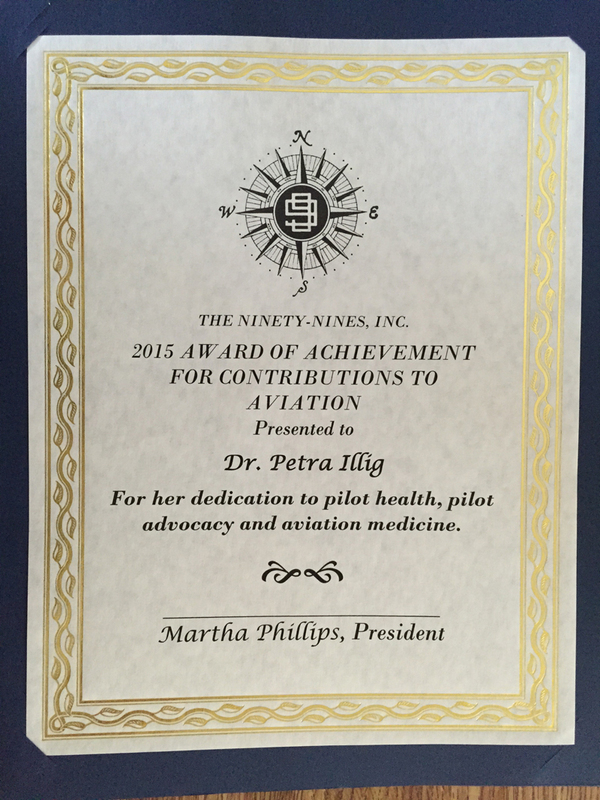 In 2011 she was awarded CAMA’s Audie and Bernice Davis Award for “Outstanding Contributions Directed to the Promotion of Health in the Civilian Aerospace Medicine Field”, and was elected to CAMA”s Board of Directors in 2012. A long-standing member of the Airline Medical Directors Association (AMDA), she was elected as Secretary in 2014. On the local scene in Alaska, Dr. Illig is a frequent speaker for aviation groups, such as the Alaska Air Carrier’s Association, local Certified Flight Instructors (CFI), University of Alaska (UAA) School of Aviation Technology, King Career Academy, and the medical residency (physician) program at UAA. 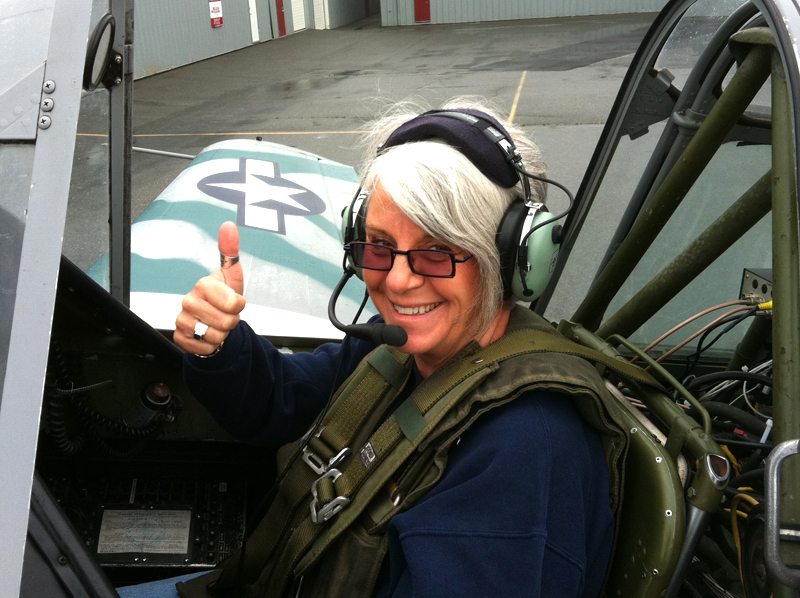 She was on the Board of Directors for the Alaska Airmen’s Association for two terms, and is a long-standing active member of the Alaska Chapter of the Ninety-Nines. Dr. Illig is highly experienced in processing not only routine FAA medical certificates quickly and efficiently, but also Special Issuance applications for disqualifying medical conditions. If an airman has a medical problem that causes the loss of his or her medical certificate, and she feels that a pilot is safe to fly, she will work hard to get their medical certificate back. Her primary concern is aviation safety. She encourages pilots to engage in good health practices, so that they can be safer pilots by taking good care of themselves. Whether a pilot comes in for a routine flight physical or requests aeromedical consultation, keeping pilots healthy and flying safely is her top priority. Passionate about the development of commercial space travel, she strongly feels that similar issues must be faced early on by the fledgling space tourism industry. She has been active in the Aerospace Medical Association’s “Task Force on Medical Guidelines for Commercial Space Travel”, and keeps in close contact with the FAA and the Russian space agency on this subject. She is a proponent of self-regulation, and is interested in assisting the developing space tourism industry in establishing medical guidelines for evaluating commercial space travelers. Dr. Illig is also a founder of Space Medicine Associates, whose mission is to provide multidisciplinary space medicine and bioastronautics consultation, training, and oversight in support of all aspects of off-world travel. In May 2014, she underwent training from the medical team at Virgin Galactic. She is currently approved by Virgin Galactic to perform medical screening examinations on their spaceflight participants to determine their health status in relation to suborbital flights. Dr. Illig flies a home-built tail wheel aircraft (Christavia MK-1). Admittedly a “fair weather” pilot, she endeavors to experience the Alaskan backcountry and wants to learn more about off-airport destinations. In 2003, she participated in the Alaska Airmen’s Association’s inaugural flight from Nome to Providenya in the Russian Far East. To date, this has been the highlight of her general aviation experiences. 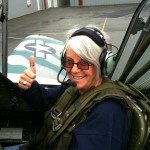 She has also been written about in Sandi Sumner’s book “Women Pilots of Alaska”.